EDITOR’S NOTE: Out of respect to the family of Officer Paul Rutherford, who was killed last month in a traffic accident, the fundraiser for Officer Steve Fluty has been postponed until mid-May, as PLEA and other groups finish up their fundraising efforts for the Rutherford family. Stay tuned to the May issue of the North Central News for the updated information. Phoenix Police Officer Steve Fluty, who has served almost 30 years in Arizona law enforcement, has been a familiar face in the North Central community as a member of the Desert Horizon Precinct’s Bike Squad. Phoenix Police Bike Squad Officer Steve Fluty is battling brain cancer and is no longer able to work. A fundraiser to help with medical bills is set for April 12 (submitted photo). Fluty joined the Phoenix Police Department 22 years ago and was one of the first members assigned to the Desert Horizon Bike Squad, which launched in October 2014 and is based out of the Sunnyslope Substation. Last July, Fluty went in for a routine eye exam and his optometrist noticed something that caused him some concern. He sent Fluty for an MRI. A short time later, Fluty was having surgery to attempt to remove a Level 4 glioblastoma, an aggressive cancer that begins in the brain and has no known cause. It is not the first time the Fluty family has dealt with this life-threatening disease. Fluty’s adult son was diagnosed with a Level 2 glioblastoma in September 2016. The family now faces some very tough days ahead, both emotionally and financially. Fluty, 51, is no longer able to work for the Phoenix Police Department, and the medical bills are piling up fast. 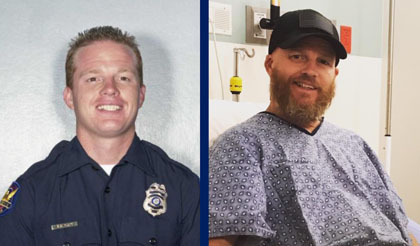 Longtime bike squad partner and now Area 61 Community Action Officer Matt Morgan is helping to organize a fundraiser for his friend, with the help of the Phoenix Law Enforcement Association (PLEA) Charities division. The fundraiser for Officer Fluty will take place on Friday, MAY 10 at the Desert Horizon Police Precinct, 16030 N. 56th St., Scottsdale. Breakfast begins at 4 a.m., with pancakes, sausage, breakfast burritos, coffee and more. Lunch starts at 10:30 a.m. and will feature hamburgers and hot dogs, chips and sodas. All food will be available for a voluntary donation (minimum $5 requested). All proceeds will benefit the Fluty family. If you can’t make the fundraiser but would like to contribute financially to help the Fluty family, you can visit https://pleacharities.org/donate/, and either donate via the Paypal link (will give you the option of going to Paypal or using a credit/debit card), or mail in a check to the address listed on the Donate page. If you use the Paypal link but choose to use a debit/credit card, look for the “Write a note” link just below where it shows your pledged dollar amount, and write in “Officer Steve Fluty.” If you use Paypal, there will be an “Add a note” section also just below the pledged dollar amount. For questions, call 602-246-7869 and ask for Cassandra, or e-mail her at cassandra@pleacharities.org.